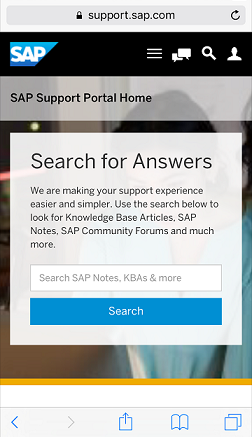 It’s time to preview the new SAP Support Portal experience! As part of the SAP ONE Support Program, we’ve been working to streamline and simplify your digital experience with us. The preview version of what the new SAP Support Portal will look like next year launches today. In a previous blog we announced these coming changes, which can be found here. You can visit the site here, but please read on to learn more. We invite you to click around and become acclimated to the new look and feel. As we work to bring the final, complete experience, don’t be surprised when some of the links may take you back to the current SAP Support Portal. 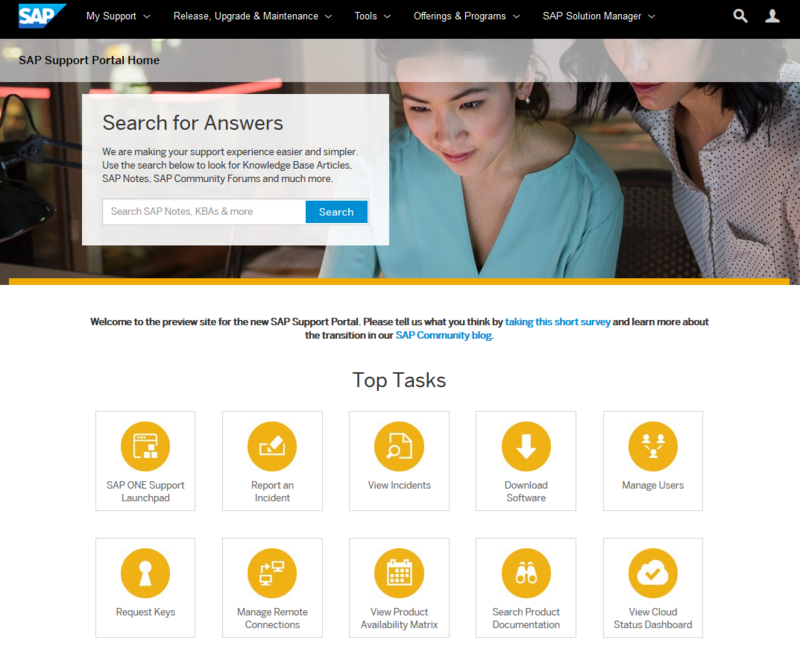 With a new design, we continue to focus on the critical reasons customers and partners visit the SAP Support Portal: search, which is front and center on the homepage, as well as important support related tasks such as reporting incidents, managing incidents, downloading software, maintaining systems, administering users, and more. Mobile optimization is a key benefit to the new site. Mobile visitors will now be able to use the site regardless of the device they are using, so please preview this on your mobile devices as well as from your desktop. During our design period we did testing with a number of customers, some of them SAP Mentors, to receive feedback on the new look and feel. Their comments included: “I definitely find it more simple” and “Everything I do is right at my fingertips” We’re excited to now hear feedback on the mobile and desktop experience from our entire customer base. When you’re ready to share your thoughts please use our survey, which is accessible here and from the homepage of the preview site. The current SAP Support Portal will remain fully accessible throughout this preview period. 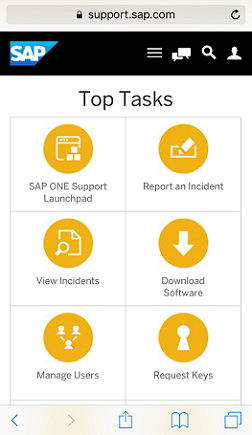 Note that this redesign will not affect the SAP ONE Support Launchpad. Thank you. It looks OK, and for me it will be “straight to Launchpad” anyway. I’d have preferred something that probably doesn’t fit with overall look an feel: a user collapsible search area, which could be folded down to a low height, horizontally arranged strip. On 1080p desktop screen at 125% browser (Chrome) zoom, none of the Top Tasks is in view (part of the first row will be, if/when the invitation to survey and blog will be removed), and the background picture adds “nothing”. Thank you for the feedback, and yes we agree that our more seasoned users will likely jump right into the Launchpad from the portal. I’ll add your feedback around the collapsible search & the ‘hero’ image as discussion points with our team. The project team is discussing potential changes based on feedback from customers. If you’d like to provide additional feedback on these changes, please contact me at supportusability@sap.com. And concerning the iOS application ? We are currently investigating options for a mobile app, and what features our customers need. There is not much to share, currently, but please stay tuned for an update on this topic in the future. New portal design is very user friendly. We use NW7.40-SP13. How this new design possible? is it driven by Fiori / HTML5 ? could you explain how to get this design? We are following our corporate branding standard, which is optimized to work with various technologies and frameworks at SAP; including HTML5 and Fiori. However, the design is internally branded so we are unable to share it. Visually beautiful. It looks simple at first sight. But on second sight? I am afraid your survey is too simplistic and will lead to misinterpretation. Of course the new portal “looks” better and simpler. The new SAP Community also looks better and simpler on first sight (because it erased a felt 80% of functionality). So be careful! The more important question is “Does it give you more productivity?” You don’t ask directly. When dealing with the new portal I will be under stress and will want to achieve one specific task in the shortest time possible. Typically I will be at least slightly bad tempered then (silently mumbling “SAP’s bugs are stealing my lifetime“) and have no eye for nice visuals. The current search leads to https://launchpad.support.sap.com/#/solutions/_/? But this one typically gives much too many results and everybody (at least everybody I talked with) says that he/she struggles to refine search there. But your central search entry point should lead to the search application that provides me the best tools for refinement of my search. And this is currently: https://launchpad.support.sap.com/#/mynotes?tab=Search. So at least from my point of view the search leads to the wrong search app currently and I am strongly struggling to find the “right” results there. There is no obvious navigation to the better search. I do agree with your comments ! Thank you very much for the feedback! Our approach to the transition aligns with your feedback of ‘desktop first – mobile too’. We definitely want to deliver a beautiful and SAP-consistent experience, but firstly it must be efficiently functional. I have made note of your other main points (imagery, ability to have top tasks above the fold and the ability to send the search query to the ‘My SAP Notes & KBA’s tool’) and will discuss with the team. Please have these comments in count. Take for example the case of SAP Community Network and please do not make the same “mistakes” like trimming existing features in the new design. It will come back if the opportunity to tie the “Spotlight News” to a specific region? We are are currently evaluating if we have the need to have region specific “Spotlight News” – a the present time we do not – but if you believe a need exists please feel free to provide us that feedback. So, theoretically looks like a decent direction, however I think the team needs to take a long hard think about usability here. As mentioned above, the lack of functionality and information “above the fold” is a major problem. The new SAP Community made the mistake of not questioning the SAP ONE design here, and this demo site makes the mistake as well. For product marketing pages, big images and empty vertical space may make sense. For sites that people use to do their work, it is anathema. Take a page out of the Fiori design guidelines and put the options people actually use day-to-day at the top of the page where people can get to them without scrolling. As someone else mentioned above, I’ll probably be a “straight to launchpad” user, but would be good to get this new support portal page off on the right foot! And to stay in the medical terminus: I really wonder where this obsessive-compulsory emphasis on “mobile only/first” is coming from? Serious question. At least I’m glad I have the opportunity to express my thoughts here. A support system is not a powerpoint and it should also not be a mobile web page (IMHO). Thank you for reading. We are excited to announce we are entering our next stage of this initiative! There are two main themes in this latest release to the preview portal. Please take a look at our most recent blog on this topic and provide your feedback through our survey or through the comments area in the blog. Thank you for all for your input over the last few months! We’re excited to announce the full go live of the newly redesigned SAP Support Portal. Love the search. It’s great that it contains SAP community results to. I always start with the Launchpad. I didn’t know there was any other way to do it. But even so, I’d start with the Launchpad.